Homemade work center constructed from hickory. Equipped with a compressor, vacuum, and electrical outlets. The top was adapted from a surplus solid-core door with a 1/4" hardboard surface. 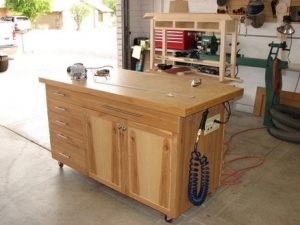 The unit features a woodworker's vise and is caster-mounted for enhanced mobility.